On February 4,1948 Sri Lanka regained political freedom from the shakles of British Imperialism when King George VI despatched his brother Duke of Gloucester as his representative to transfer power from Westminster to Temple Trees. Already, there the first Parliamentary general election was held in 1947 to elect one hundred and one (101) members for 95 electorates on first past the post basis. Badulla two (2) seats and so on which made up 101 elected members of Parliament to represent the 95 seats. The Prime Minister enjoyed the privilege of recommending six members to be appointed by the Governor-General to represent the unrepresented interests. What a feeble performance by the Prime Minister. Had not the Governor-General an iota of common sense to think whether those remnants of British imperialism really represent ‘unrepresented interests’ or representing themselves? Imagine their performance to the ‘unrepresented interests’. Gratiaen resigned on being appointed a puisne Judge While Martensz resigned on December 29, 1948 a few months after his appointment. G. R. Whitby resigned early 1948 owing to illness. This comprised in a nutshell shows the path the leaders of the day steered our newly independent nation towards progress and prosperity. Mr. S. W. R. D. Bandaranaike, Independent Lanka’s first Minister of Health and Local Government and the Leader of the House of representatives delivered his address of Thanks to Duke of Gloucester. Being a visionary he professed that the aspirations of the majority should be given due recognition in order to make the regained political freedom a success. Mr. Bandaranaike presented his Address of Thanks after Duke of Gloucester lowered for the last time the Union Jack and hoisted the Lion Flag of the Free and Independent Nation. The Lion Flag that was hoisted on that historic occasion was the two thousand year old ancient flag, of this resplendent country. The sacred flag was unadulterated with green and saffron stripes. During the British period the Lion Flag was removed to the Chelsea Hospital Museum. 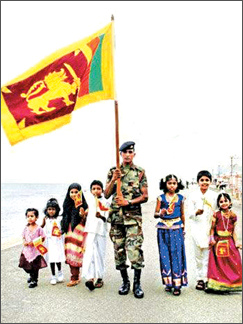 From there national patriot E. W. Perera brought the Lion Flag following a relentless struggle with the British. He could not carry his written representation since every scrap of paper was read and scrutinised by the British at the time of departure. He got the letter stitched to the sole of his shoe and travelled to England. The National Radio starts the day with two excerpts of Mr. Bandaranaike’s speech. Among other matters, he says, political freedom must go hand in hand with the economic freedom, freedom to educate the children, facilities to live in salubrious environments and a whole gamut of facilities which the common man was denied during the alien rule. The British grossly denied education to the villager. During the entire rule of the Portuguese, the Dutch and the British - totalling four hundred and forty-three miserable years from 1505 to 1948, not a single two-storeyed building was put up for village schoolchildren. The British rule started with King George III (1815-1820) and continued their sway under eight monarchs until Lanka jumped out of their treacherous clutches in 1948. Upto that historic year, we had George IV 1820-1830; William IV 1830-1837; Queen Victoria 1837-1901; Edward VII 1901-1910; George V 1910-1936; Edward VIII 1936 who abdicated the British Throne in favour of marrying Mrs. Simpson; George VI from 1936. Queen Elizabeth II ascended the British Throne in 1952. By that time much water had flown under our bridges. Of course we recognized Her Majesty as the Head of the Commonwealth of Nations of which we are a founder member. Lanka was not the only Asian country that regained freedom from the British in 1947 and 1948. India, Burma (Myanmar) made astounding impression on the Asian scene following their newly won freedom. Myanmar in particular sent out all those non nationals who were living as illegal immigrants. The country was made absolutely free and safe to the people who spoke and understood the country’s language and culture. All those who were willing to share the common aspirations were provided with equal facilities in all spheres of activity. In India, the British treachery paid its most heinous crime when they returned to the teeming masses of India, a bi-furcated land called Hindustan and Pakistan. Before India became free from Britain, already Pakistan had been carved out as a Separate Nation. Later, a third country came into being in the Eastern Part of India. That was Bangladesh. Lanka, however, was too small (in size) a country for the British to divide into fragments. The British created artificial divisions among the Sinhala people and Tamil people, created artificial problems between Northern Tamil and Eastern Tamil people, created communal differences among the Tamil speaking and Sinhala speaking people. When the unsophisticated, non-English educated Sinhala carpenters from the South enjoyed a lucrative furniture business in the North, the Tobacco merchants, banana boutique keepers provided the best of Jaffna cigars and home grown banners from Chunnakam. Then nobody had any language problem, learning and speaking each others languages with thorough proficiency. The petty politicians-those nobodies who wanted to be somebodies took up the language as an ‘issue’ to hoodwink the masses and to enter the mainstream of politics. As a result the country began to face crisis after crisis. The learned, educated and the national conscious men and women came to be side-tracked. Their due positions were doled out to foreigners. For instance, Sri Lanka’s first university was handed over to an Irish, Sir Ivor Jennings; another foreigner Dr. H.W. House was imported to head the Directorate of Education.